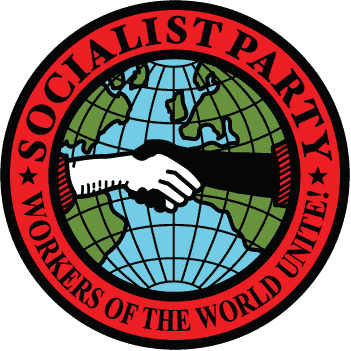 THE SOCIALIST PARTY strives to establish a radical democracy that places people’s lives under their own control — a non-racist, classless, feminist, socialist society in which people cooperate at work, at home, and in the community. Socialism is not mere government ownership, a welfare state, or a repressive bureaucracy. Socialism is a new social and economic order in which workers and consumers control production and community residents control their neighborhoods, homes, and schools. The production of society is used for the benefit of all humanity, not for the private profit of a few. Socialism produces a constantly renewed future by not plundering the resources of the earth. Under capitalist and authoritarian “Communist” states, people have little control over fundamental areas of their lives. The capitalist system forces workers to sell their abilities and skills to the few who own the workplaces, profit from these workers’ labor, and use the government to maintain their privileged position. Under authoritarian “Communist” states, decisions are made by Communist Party officials, the bureaucracy and the military. The inevitable product of each system is a class society with gross inequality of privileges, a draining of the productive wealth and goods of the society into military purposes, environmental pollution, and war in which workers are compelled to fight other workers. People across the world need to cast off the systems which oppress them, and build a new world fit for all humanity. Democratic revolutions are needed to dissolve the power now exercised by the few who control great wealth and the government. By revolution we mean a radical and fundamental change in the structure and quality of economic, political, and personal relations. The building of socialism requires widespread understanding and participation, and will not be achieved by an elite working “on behalf of” the people. The working class is in a key and central position to fight back against the ruling capitalist class and its power. The working class is the major force worldwide that can lead the way to a socialist future – to a real radical democracy from below.